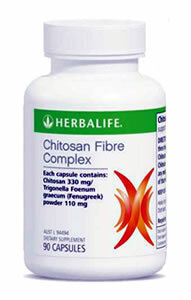 Chitosan Fibre Complex (a dietary fibre) is blended with Fenugreek to assist with the maintenance of regularity and suppression of appetite as part of a kilojoule/calorie controlled eating plan. Contains LipoSan Ultra, a patented form of Chitosan Fibre Complex that becomes soluble in stomach acid and works faster. This means you can take this product right before you eat, not one hour before. Each capsule contains Chitosan 330.0mg and Fenugreek powder 110.0mg.